A famous travel related website TripAdvisor has listed up 30 best destinations for foreign visitors. 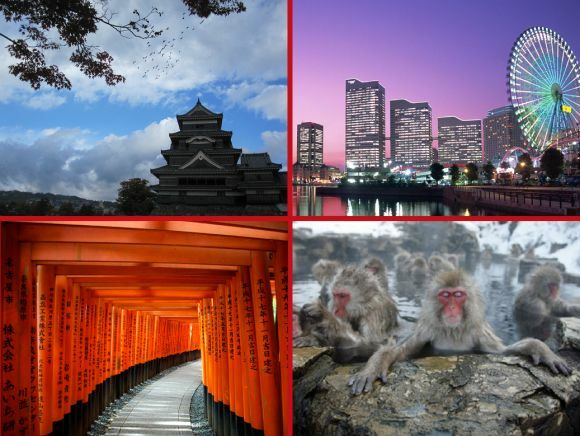 The findings are based on their visitor comments about Japan. Near many of the destinations mentioned below, Inshallah, you will be able to find at least some kind of Halal items to feed your stomach while enjoying the breathtaking attractions Japan has to offer to its local and foreign visitors alike. Although, the observation floor of the Roppongi Hills complex in Roppongi area isn’t the only place to get a bird’s eye view the capital city of Japan, but it’s newer than Tokyo Tower or the Metropolitan Government Building in Shinjuku. It’s also less crowded than the Tokyo Skytree, and at 270 meters (886 feet) above sea level, is a great way to get a grasp on the immense scope of Japan’s largest city, Tokyo which is in fact, one of the largest city in the world. Ryogoku is known as the heartland of sumo, and rikishi wrestlers are a common sight in the neighborhood and around the train station. Of the six professional Grand Sumo Tournaments held every year, Ryogoku Kokugikan Sumo Hall stages three—in January, May, and September. You might not guess it from its name (which means “Storm Moountain”), but this neighborhood west of Kyoto’s city center has a beautifully tranquil bamboo grove and forest crisscrossed by walking paths. As many as 4000 exhibition pieces – dynamic displays of original equipment, actual demonstrations by operators, instructive videos, and more. Our exhibitions provide an easy-to-understand introduction to the concept of “making things.” Experience “making things” first hand and discover the wonders of “spirit of being studious and creative.” These are the words the website of this museum describes about it. Loud and brash, the most vibrant street in Shibuya connects directly to its famous Scramble Intersection and is always packed with shoppers, dinners, and drinkers. For decades, it’s been a magnet for shoppers, after-work revellers and disaffected youth. But Center-Gai’s final weekend of infamy is now behind it. The pedestrianised shopping street, which connects to Shibuya’s famed scramble crossing, unveils its new name today – and it sounds more like a children’s TV show from the 1970s. Say goodbye to Center-Gai, hello to Basketball Street. Meiji Jingu is a Shinto shrine. Shinto is called Japan’s ancient original religion, and it is deeply rooted in the way of Japanese life. Shinto has no founder, no holy book, and not even the concept of religious conversion, but Shinto values for example harmony with nature and virtues such as “Magokoro (sincere heart)”. In Shinto, some divinity is found as Kami (divine spirit), or it may be said that there is an unlimited number of Kami. You can see Kami in mythology, in nature, and in human beings. From ancient times, Japanese people have felt awe and gratitude towards such Kami and dedicated shrines to many of them. This shrine is dedicated to the divine souls of Emperor Meiji and his consort Empress Shoken (their tombs are in Kyoto). Emperor Meiji passed away in 1912 and Empress Shoken in 1914. After their demise, people wished to commemorate their virtues and to venerate them forever. So they donated 100,000 trees from all over Japan and from overseas, and they worked voluntarily to create this forest. Thus, thanks to the sincere heart of the people, this shrine was established on November 1, 1920. Sanjusangendo (三十三間堂, Sanjūsangendō) is the popular name for Rengeo-in, a temple in eastern Kyoto which is famous for its 1001 statues of Kannon, the goddess of mercy. The temple was founded in 1164 and rebuilt a century later after the original structure had been destroyed in a fire. The temple hall is with 120 meters Japan’s longest wooden structure. The name Sanjusangendo (literally “33 intervals”) derives from the number of intervals between the building’s support columns, a traditional method of measuring the size of a building. In the center of the main hall sits a large, wooden statue of a 1000-armed Kannon (Senju Kannon) that is flanked on each side by 500 statues of human sized 1000-armed Kannon standing in ten rows. Together they make for an awesome sight. This collection of traditional thatched farmhouses makes for a beautiful glimpse of a bygone era, whether visited when the surrounding fields are lush and green during summer or when the whole village is blanketed in winter snow. Originally, these famous farmhouses were constructed some 260 years ago by the local villages for the purpose of taking care of their agricultural crops. Some of these farmouses are being used by some villagers even now. According to the legend, in 721 AD the pious monk Tokudo Shonin discovered a large camphor tree in the mountain forests near the village of Hase in the Nara region. He realized the trunk of the tree was so large that it provided enough material for carving two statues of the eleven-headed Kannon. The statue he commissioned to be carved from the lower part of the truck was enshrined in Hasedera Temple near Nara; the statue from the upper half (actually the larger of the two) was thrown into the sea with a prayer that it would reappear to save the people. The center provides a good opportunity to get a detailed information of where you may want to go during your stay in Japan. Located in front of Kaminari-mon Gate, Asakusa Culture Tourist Information Center provides information and services helpful to visitors of Taito-ku in four languages—Japanese, English, Chinese, and Korean—under the concept “Search, Show, Support.” Services include free public wireless LAN, currency exchange, and ticket sales. The facility is also conveniently equipped with a café, nursing room, and terrace observatory. While many visitors to Miyajima Island are content to snap a picture in front of its torii gate that rises out of the ocean, those that make the moderate hike to the top Mt. Misen, the highest point on the island, will be rewarded with spectacular views of the prefecture’s coastline (or if you’re not in the mood to walk, you can always take the cable car). Imagined as “an abandoned toy factory of the future,” this avant-garde theater offers non-verbal performances that combine dance, mime, and magic techniques. Nara Park (奈良公園, Nara Kōen) is a large park in central .Nara. Established in 1880, it is the location of many of Nara’s main attractions including Todaiji, Kasuga Taisha, Kofukuji and the Nara National Museum. The park is home to hundreds of freely roaming deer. Considered in Shinto to be messengers of the idols, Nara’s nearly 1200 deer have become a symbol of the city and have even been designated as a natural treasure. Nara’s deer are surprisingly tame, although they can be aggressive if they think you will feed them. Deer crackers are for sale around the park, and some deer have learned to bow to visitors to ask to be fed. The Yokohama neighborhood’s official name is Minato Mirai 21, but none of the locals use the numerical suffix when talking about the city’s bayside entertainment area with glitteringly futuristic architecture. Minato Mirai 21 is a modern urban development that was created, and continues to evolve, on 186ha of land. A shipbuilding facility that used to divide Yokohama’s two main urban centers on Tokyo Bay was relocated, and additional land was reclaimed from the sea. In 1989 an exposition was held to mark the 100th anniversary of Yokohama’s city status and the 130th anniversary of the opening of Yokohama Port. Following that event development gathered momentum, and now the area boasts office blocks, commercial facilities, hotels, amusement parks and convention facilities, as well as such cultural amenities as art museums and concert halls. This, the new face of Yokohama, offers an entire spectrum of urban functions and attracts more than 50 million visitors every year. Kenroku garden is one of the three mopst beautiful gardens in Japan. The very name of the garden means a garden combining siz attributes of a perfect garden. As a strolling-style landscape garden, it incorporates fancy designs in every corner, achieving wonderful scenery in all seasons. Naritasan (Naritasan Shinshoji Temple) is a large and highly popular Buddhist temple complex in Narita City, not far from Narita Airport. It is a great site to visit if you have three or more hours to spend around the airport and wish to catch a glimpse of historic Japan. Naritasan was built in the year 940 around its main sacred object of worship, a statue of the Buddhist Fudo Myoo deity. Kobo Daishi, the founder of the Shingon Sect and one of the most important figures in Japan’s religious history, is said to have carved the statue. Mount Fuji (富士山, Fujisan) is with 3776 meters Japan’s highest mountain. It is not surprising that the nearly perfectly shaped volcano has been worshiped as a sacred mountain and experienced big popularity among artists and common people throughout the centuries. Mount Fuji is an active volcano, which most recently erupted in 1708. It stands on the border between Yamanashi and Shizuoka Prefectures and can be seen from Tokyo and Yokohama on clear days. Need a break from Tokyo’s constant hum of urban energy? This massive garden is filled with cherry blossom trees, ponds, and, a rarity in Japanese parks, large grassy fields for kids to run and play in. Kembu translates literally as “sword dance,” and this facility in Kyoto not only puts on theatrical combat performances, but also offers lessons for would-be samurai who want to learn the basics of swinging a sword for the stage. Also known as Hell Valley Wild Monkey Park. Also known as that place where monkeys soak in the hot springs. Think everything in Japan is compact? Until 1998, this was the largest wooden building in the world, and it houses a 14.98-meter (49.1-foot) bronze Buddha statue, known as the Diabutsu of Nara. Hiroshima’s Miyajima Island makes the list again, this time for its Itsukushima Shrine and torii gate, one of the most iconic views of Japan for generations. Since ancient times, Miyajima has been regarded as one of the “Three Most Beautiful Spots” of Japan, and as a part of the Seto Inland Sea National Park, it has received several distinctions, such as a place of extraordinary scenic beauty, exceptional history, a scenic preservation area, and a natural monument. The virgin forests neighboring Mt. Misen are representative of the lush greenery and abundance of nature which still covers the entire island even now. Take a stroll in town, and the sights of the souvenir shops and ryokan (Japanese-style inns) will remind you of the liveliness and prosperity of a port town lined up with stores and houses. The contrast of the somber, still standing structure that was at the center of the atomic bomb blast and the beautiful riverside park later built around it serve as powerful reminders of the cost of war and value of peace not only to Japanese visitors but also to the people from all over the world. Every year in August, people gather here to commemorate the atomic bomob which dropped here in 1945. Until recently, Fushimi Inari wasn’t on the itinerary of many foreign visitors to Kyoto, as it’s tucked away in the foothills away from most of the city’s dozens of compelling attractions. Thanks to word of mouth, though, it’s become a major draw for overseas visitors to Japan, as the shrines natural surroundings, hundreds of alters, and seemingly never-ending torii tunnels provide an atmosphere unlike anything you’ll find in any other country.